Need easy ways to save money that actually work? 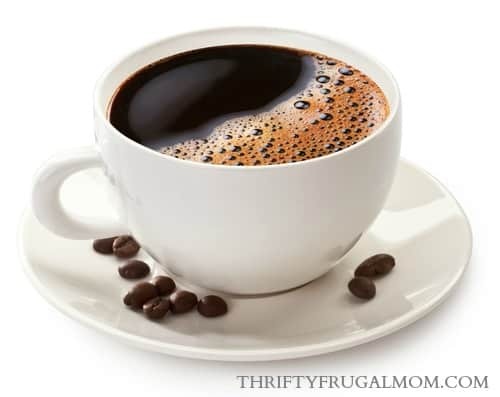 I’m a frugal mom of 4 and these are my favorite frugal ways to save! And they can help you trim your budget too. There are affiliate links in this post. If you use these links, I may earn a commission- please read my full disclosure policy. I think it’s safe to say that I got my love of saving money from my Dad. He is a great storyteller and my kids are always begging him to tell them about when he was younger. He does a great job of including lots of little details that make it easy to imagine what things were like back then and it’s always fun to get a peek into that era. One of the things that comes through so often in his stories, without him even meaning it to, is how mindful he was of saving money and living frugally. And I just have to smile. Because many times the way he talks about things is how I would think about it too! Without even trying it, I tend to look at life through the lens of frugality. But I know most people aren’t that way. And there are so, so many ways that you can save and cut your expenses that if you aren’t a natural at saving money, it quickly can feel overwhelming! And I can totally understand why. Which is why I wanted to share my favorite easy ways to save money with you. I tried to think of things that are relatively simple to do but that will make a significant impact on your budget. RELATED: 10+ Easily Doable Side Hustle Ideas that Will Make You $500/Mo. I’m a busy mom, after all, so I get it. Most of the time if it isn’t simple, I won’t do it! So I wanted these money saving ideas to be easily doable, allowing you to feel the success of cutting your expenses without taking a lot of time to do it. One word of caution though if you happen to be new to thinking about saving money. I recommend choosing just two or three of these money saving ideas to focus on instead of trying to take on all 25. You want to make it easy to succeed, not set yourself up for failure! Once you get those 2 to 3 in place, try doing a few more thing. Little by little you’ll see the savings increase! Grocery apps are such an easy way to save a little extra on your groceries! And one of my favorite things is that they often have savings offers that are good on any brand of a product such as milk, bread, fruit, diapers and more. – This one is the absolute easiest to use…you just scan your receipt and that’s it- they will figure out if you bought qualifying items. I’ve only used it for a couple of weeks and I already have earned $9 in Amazon gift cards! – This one isn’t really a grocery app per se, but I like to use it when I’m at the grocery store to earn points (or kicks as they call them) that I can redeem for gift cards. It only takes a couple of extra minutes and if I’m not pushed for time it’s worth it for me! It’s no secret that produce is one of those things that can quickly rack up your grocery bill! Instead of grabbing whatever catches your eye, stop and look to see what’s on sale and buy that instead. Even just thinking about what is in season is often helpful since that will most likely be less expensive. Unless I have a coupon for a brand name item and can get it cheaper, I pretty much always buy the generic version. Most of the time I can’t tell much of a difference in quality anyway. And I highly recommend shopping at Aldi if you have one in your area! They are inexpensive and even have a money back guarantee on their products (all of which are generic brand), so if for some reason you try something and really don’t like it, you have nothing to lose! Since meat is so expensive, choosing to go meatless at least once a week is a super easy way to save! Need recipe ideas? Check out these 30 easy meatless meal ideas. When you do buy meat, it’s almost always cheaper to buy it in bulk! At a grocery store, look for family size packs which are typically at least 5 lbs. in weight, but are priced less per pound than the smaller packages. If you don’t think you’ll use it all within a couple of days, package the remaining portion in a freezer bag and save for another meal later! Looking for a great place to get quality meat? Check out Savory Butcher! They are a growing company and aren’t available in all areas, but are slowing expanding their market. Savory Butcher regularly has boneless, skinless chicken breast for $1.99/lb and ground beef for $2.99/lb. They also carry bacon, ham and chicken thighs. This is such an easy way to save money and be healthier! A few of my favorite convenience foods to make are: Homemade Bisquick Mix, Homemade Cream Soup Mix, Homemade Salad Dressing, Easy Healthier Alfredo Sauce and Homemade Chocolate Syrup. View eating out as a special privilege that only happens at most a couple of times a month. Instead, start cooking your own meals. Even if you cheat and buy a few frozen pizzas here and there, you’ll still be spending less than you would if you went out to eat! Need some easy meal ideas? Check out my $225 a Month Menu Plans! RELATED: Struggling to make cooking at home work for you? eMeals is a great way to help meals at home feel doable! They provide you with all of the recipes that you need as well as your shopping lists, which saves you time and makes eating at home super easy. Click here to get a FREE 14 day trial of eMeals! Even if you spend $7 a day on lunch just 3 days a week, that ends up being an expense of over $1,000 a year! Wow! Packing your own lunch is obviously a great way to save. Believe it or not, most Americans throw out over $1,000 worth of food annually! Thankfully, there are lots of easy things you can do to reduce your food waste. And I love this list of practical uses for 8 foods that you very likely are throwing out! Such a simple way to save. I know, they’re so handy to grab but they aren’t exactly the cheapest thing around, especially considering the fact that you throw them out once you use them! Use rags instead. Cut up old towels, t-shirts and sheets into whatever size you like and you have handy washable rags! And no, I’m not meaning that you should skip washing your hands. Yuck! I’m talking about making your own foaming soap. 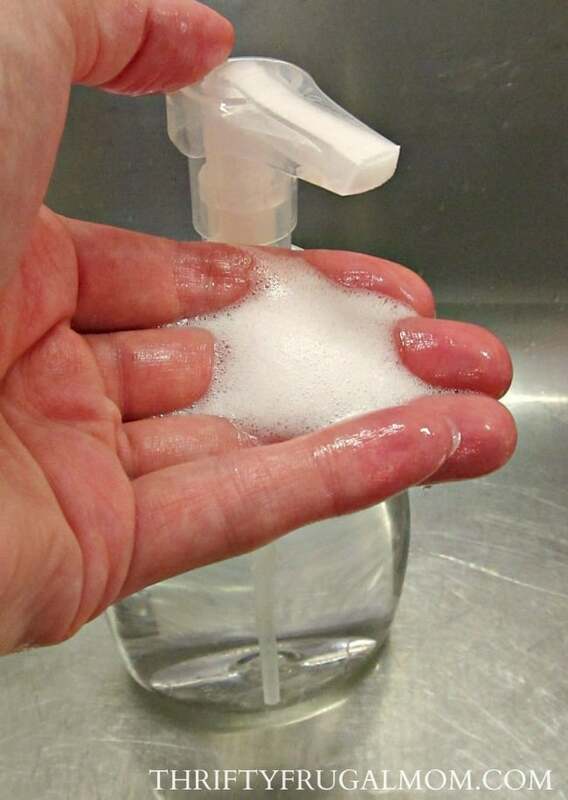 It’s super easy and it will make one small bottle of regular soap last at least 4 times as long! I love using my homemade bathroom cleaner– it’s super effective and way less expensive! I also use a lot of vinegar and water for cleaning. You can’t get much cheaper than that! Most people use the same amount of detergent no matter what size load they do…and even if you cut it back, you are still using only a tad less than you would for a full load. Doing only full loads will also save you electricity and if you pay for water, you’ll save quite a few gallons too in the long run by doing only full loads! Dryers are one of the biggest energy hogs in your house. We use our drying racks a lot and we also love our retractable clothesline! It’s perfect for city living! We switched to nearly all CFL light bulbs about a year ago and were amazed at how much it lowered our electric bill! We easily saved at least $15 a month. And while they do cost a bit more up front, the savings definitely makes them worth it! Love quality razors but hate the high cost? Switch to Dollar Shave Club and enjoy the best of both worlds! Their cheapest razors cost just $6 for four replaceable razor cartridges! Check them out here. Unless it’s a book that you know you really want to own, stop buying books and borrow them from your library instead! I also just discovered Hoopla. It’s a great way to borrow ebooks, audiobooks and movies from your local library, but from the convenience of your home. So great! Most times when we travel, we like to use Airbnb for our accommodations. Not only is it often cheaper, but it’s also a lot more personal and we can usually find a place that has a kitchen or kitchenette too, which allows us to save money on food by making some of our own meals. Obviously regular coffee is easy to brew at home, but did you know that you can also easily make your own frappes too? And a quick search on Pinterest will help you discover lots of easy to make homemade lattes as well. Not only will you be healthier, but you’ll also save big bucks if you skip the beverages both at home and when you go out to eat. If you’re going to shop online anyway, why not save in every way you can? I love earning cash back with Ebates. Basically, just by using them I can earn an average of 5% cash back on almost all of my online purchases! Interested in earning money with Ebates too? You’ll get $10 automatically if you create an Ebates account through my link! When you do decide to eat out, watch for coupons that you can use to save on your bill. Another great option is to join restaurant fan clubs (links can usually be found on their website) to receive money-saving offers. If you have children, learn where they can eat free or for half price and dine at those places. For chain restaurants, we also love saving by buying discounted gift cards from Raise.com and then using them to pay for our meal. If you create an account at Raise.com through this link, you’ll also get $5 to use toward your first purchase as long as the transaction is within 30 days of signing up! Ride your bike or walk when possible. If you are using your car, combine errands to save on gas. If you are heading to an appointment or the grocery store, think what other stops you could make while heading in that direction. It’s amazing how those little changes can add up to big savings! Chances are you are spending way more on your phone bill than you’d need to. There are lots of great inexpensive options available that could easily save you $100 a month! We’ve been using Ting for cheap cellphone service for the last 5 years now and don’t spend more than $35 a month for my husband and I total. Yes, total. It’s awesome! If you’re like most parents, one of the big things that makes it hard to go on dates is finding a babysitter or being able to afford the cost of one. An easy solution is to find another family that you trust and swap babysitting with them. This has been a big life saver, or maybe I should say marriage saver, for us! I’ve been buying almost all of my greeting cards at Dollar Tree for years. You really can’t beat two cards for $1.00! That’s easily less than half of what you’d pay anywhere else. Along the same line, I also like to buy gift bags and wrap there as well. I don’t have time these days to go out and do a lot of shopping, but when I do, I usually first check places like Marshall’s, Ross and Burlington for the items that I need since they consistently have good prices! Love shopping online? Then daily deal sites are a great option for you to save money! There are lots of different daily deal sites out there. Some of my favorites are Groupon (savings on experiences and restaurants), Groopdealz (home decor, baby & kids and a little clothing too), Zulily (clothing, home decor, household items, toys and more) and One Kings Lane (great for home decor and kitchen items). The only downside of these sites is that the deals are for a limited time and so you have to constantly be watching them. Or you can do like I do and just occasionally pop in to see what they have to offer. Sure, you might miss some great buys, but you can still benefit without investing quite as much time. What are your favorite frugal ways to save money? Do you do any of these things? These are great money savers. I especially love my money saving/rebate apps. I only recently found Shopkick but it has quickly become my fave! This is an awesome list! One thing I do to save money is to buy items that we use all the time in bulk. Spices for instance, I can get a little or a lot (depending what I need) at the bulk food store and refill the spice bottles I have. Yes! 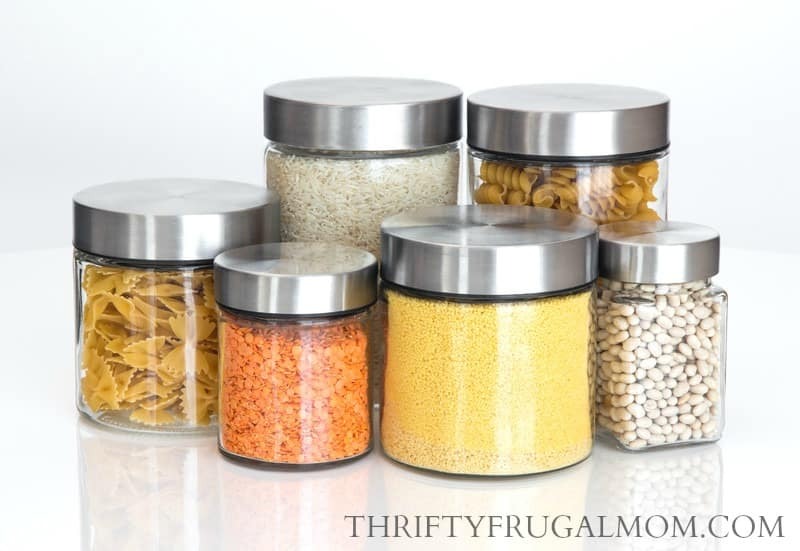 So glad that you mentioned that- buying in bulk is such a great way to save! I'm a fan of buying spices in bulk too. Since I do a lot of from scratch cooking and baking we use kind of a crazy amount of spices and herbs and it just makes sense to buy them in larger amounts most of the time! These are all great tips! I have not tried any grocery savings apps but want to give it a try. We have changed out our light bulbs, do full loads of laundry and even got rid of paper towels already. We started a while ago to try to limit our waste and it is nice that these are also money savings ideas as well! Sounds like you already are saving a lot! And yes, the grocery saving apps can be a great money saver, especially depending where you shop and what you buy. I'd definitely recommend checking them out to see if they'll work well for you. What a great ideas! I can't wait to start implementing a few of these tips! I second-hand shop all the time. I use Freecycle all the time and created Toy-cycle.org to connect families in local groups to exchange free used toys and games. Ah, yes, Freecycle! I used to use them a lot when we had two vehicles and I was able to get out more easily. And I love the Toycycle concept. Such a great idea! Love your tips. I must tell you one funny story. We tried to teach our children to take care of themselves regardless of gender. That meant our sons learned basic housekeeping skills and our daughters learned basic mechanical and trade skills. We were moving to a smaller home when our youngest child (son) was a senior in high school. As we cleaned out closets, I found several pairs of jeans several sizes too small. I asked him why these had not been sent to Goodwill. He replied, "Mom, these are my washer jeans." "Washer jeans? What is that?" I asked. Reply, "You told us to always do only full loads of laundry. Is I only need to wash one item I add these to make a full load..". Obviously, I had not explained things very well! Oh my goodness. That is too funny! Thanks for the laugh. Kind of defeated the purpose of cost saving, maybe? ;) And as a side note, I love that you had your kids learn all of those things. We have our son doing housekeeping skills but I hadn't thought about having our girls learn mechanical and trade skills. That's such a great idea! Great money saving tips. I have 3 little ones and they grow fast. I love buying clothes online at Old Navy. Many times they have additional discounts on clearance items and a regularly $300 tally can turn into $75. Best to shop right after holidays when they still have inventory but want to make room for new seasonal items. Also seasonal items at Walmart get discounted best are compo packs of Febreeze since cranberry scent can be purchased for less than 50% or one regula bottle. Great tips, Agnes! Thanks so much for sharing them! Hi Lydia! Thank you for this great list. There are so many good suggestions on this list. In our family, we stopped using paper towels and replaced them with ordinary towels (we bought cheap guest towels at an outlet). I've not done the math on how much we're saving on it yet, but it's quite a bit of money per year. Today, we actually bought handkerchiefs for those runny noses. I know it might seem old school and a bit yucky to some, but hey, it saves money and the environment. That's simply win-win. Thanks again for the post, Lydia!